I could almost hear a chorus of silent groans coming from the teachers sitting around the table in the staff room at P.S. 10 in Brooklyn. It was March 17th, 2005, my first day working as a consultant at the school. The new principal, Jett Ritorto, wanted me to introduce inquiry projects and investigative Choice Time to the kindergarten teachers. But it was mid-March and this was just one more new addition to their already over-programmed day. I wasn’t welcomed with open arms! I recognized this plea from my own not-so-long-ago days in the classroom. I had my theme, my materials, and my time-schedule all set up and then, in would walk a new staff developer with her own agenda, turning all of my plans upside down. I assured them that we would not be dropping the transportation unit. Instead we would see what happened if we approached it in a new way. I suggested that they each go on a neighborhood walk with their class that week, with a focus on exploring the different ways that people could travel, to, from, and around their neighborhood. After the walk, they should encourage children to share their observations. This would give the teachers a sense of what the students already know and also what form of transportation seemed to interest them the most. That would allow them to narrow the focus of the class’s transportation study. When I came back to the school the next week, I met with each teacher individually. The inclusion team, Dana Roth and Karen Byrnes, were excited and eager to share their experience with me. Their children had lots of questions about the subway and that was where they wanted to focus their study. The three of us spent the rest of the period preparing an anticipatory web, plotting out the many possibilities for a subway study. All seemed well. Later in the week they contacted me and sadly told me that a subway study was out of the question. One of the students was confined to a wheelchair and would have to be excluded from all subway trips. They decided to switch to a bus study. I suggested, however, that they first bring the problem to the class and see what kind of solution the children came up with. The children were outraged! “That’s not fair! Saim should be able to go on the subway just like us!” Here began a most unusual transportation study – The Wheelchair Project. 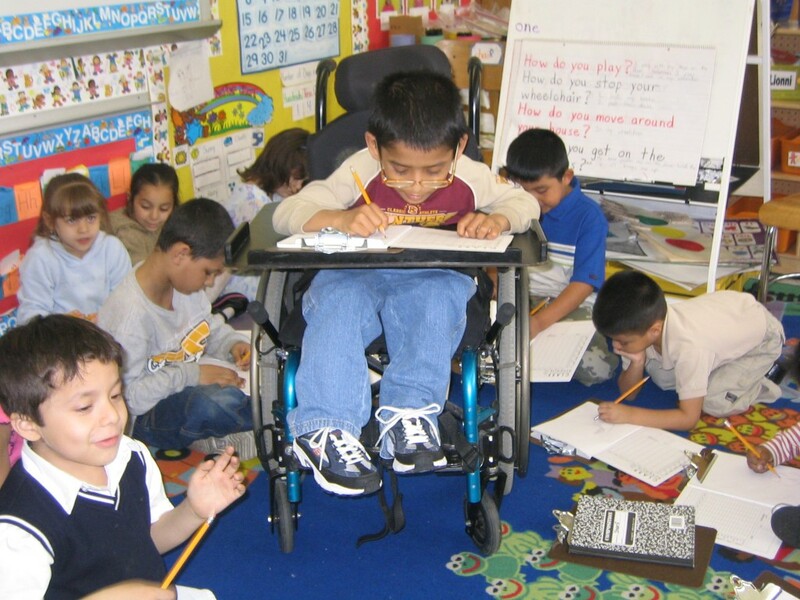 The class decided to find out more about Saim’s wheelchair and what it was like for him to move around the school and neighborhood. Saim was pleased as punch to be the center of attention (Dana said that she would not have pursued this route if the child was sensitive about being singled out). They began the study by interviewing Saim. After the interview, they all sat around him in a circle, observing and drawing. 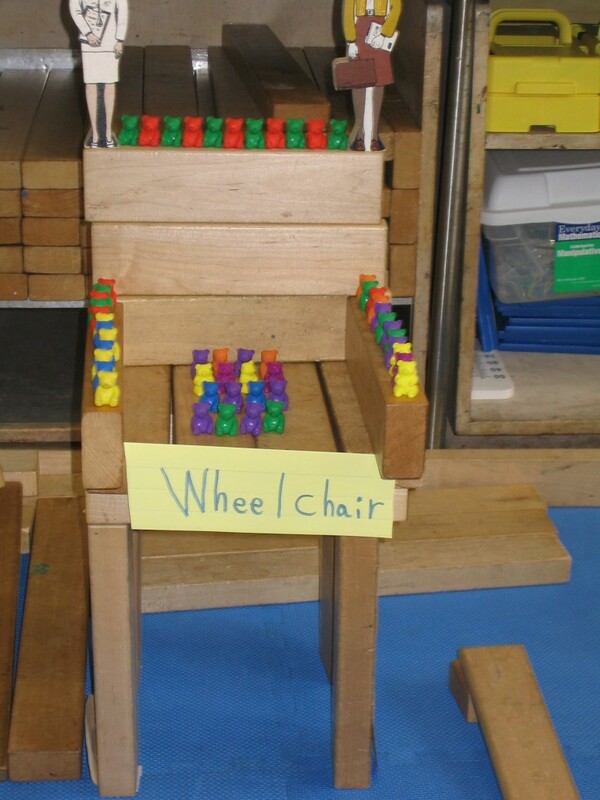 The teachers began webbing what children already knew about wheelchairs and also collecting their “wonderings” on post-its and adding these to the web. 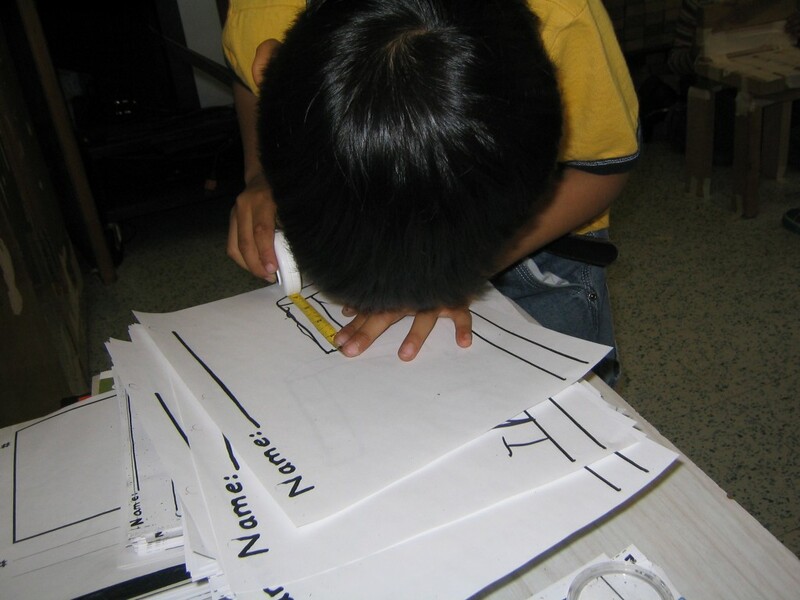 From these activities, they decided to focus their study on movement and accessibility. These were the two areas where the children had the most interest. News about this unusual transportation study traveled around the school like hotcakes. 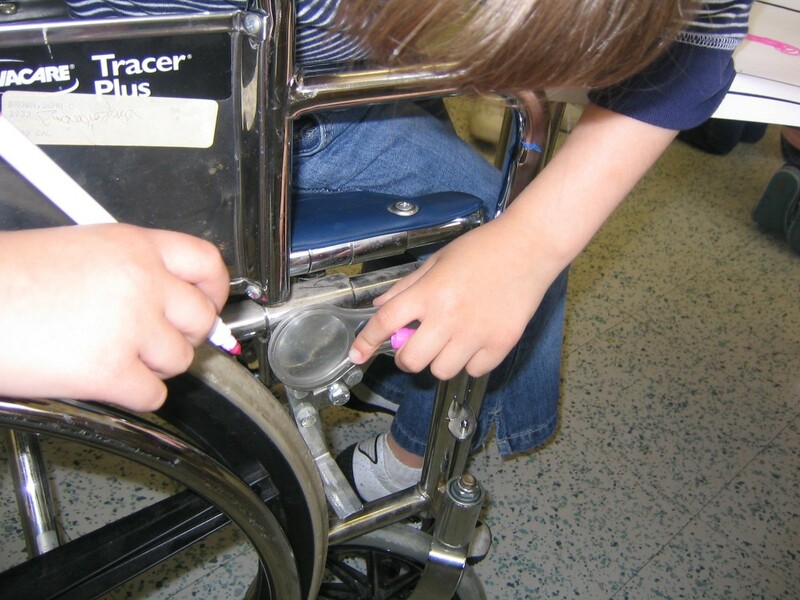 When the school’s physical therapist heard about the investigation, she provided the class with an unused wheelchair. This became a very popular wheelchair observation center. 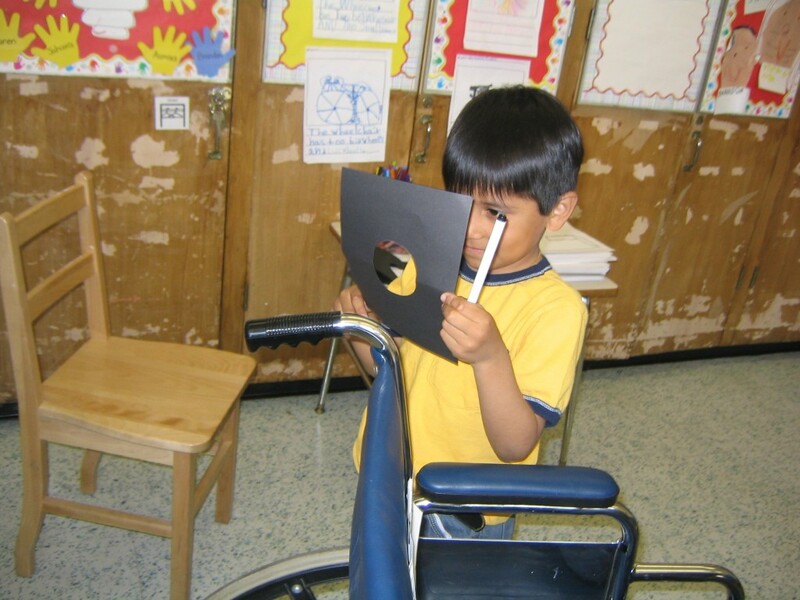 Children used magnifying glasses, tape measures, and detail finders (a square of black paper with a peek-hole cut in the center) to look closely at the different parts of wheelchair. They drew the wheels, the brakes, and the gears. 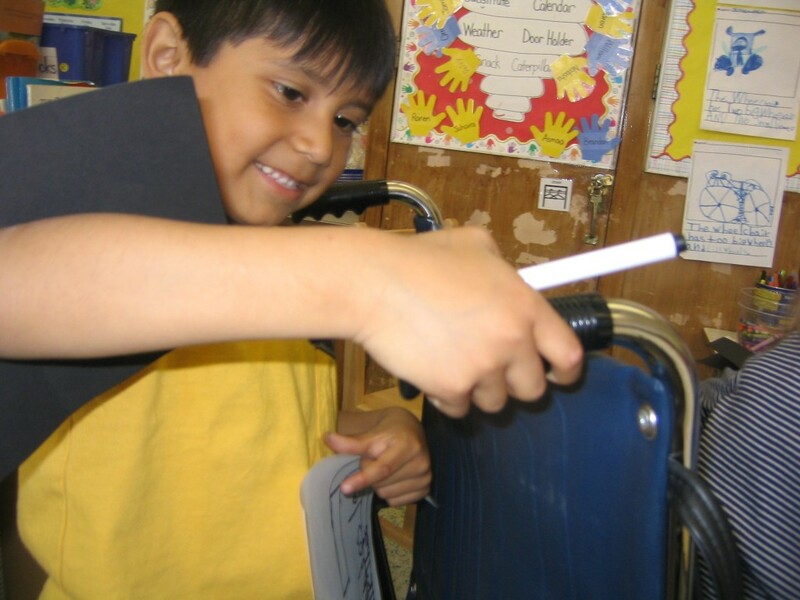 Then they shared their drawings and ‘recordings’ with the children in the block center who were constructing their own version of a wheelchair. This chair took many days to construct. 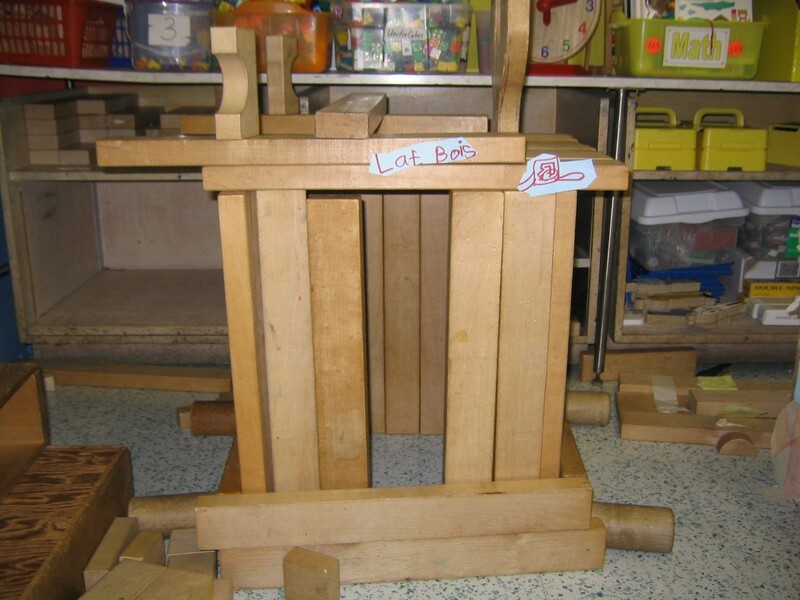 It sometimes fell over and was rebuilt often and eventually was held together with yards of masking tape! The class visited the school bus that brought Saim to school to see how the lift helped children with walkers and wheelchairs get on and off. They interviewed the driver and also met Manny, a very affable upper-grade child who used a walker to help him move about. Manny was invited to the classroom where he was interviewed. He then gave each child an opportunity to try out his walker. They walked took neighborhood walks, checking to see which stores and sidewalks were “wheelchair friendly.” Then they walked around the school to find out if their school was wheelchair accessible. The front of the school had lots of steps! How did Saim get into school? In an exciting moment of discovery, they found the symbol that they saw on the lift bus, along with an arrow. The class followed the arrows until they came to the ramp entrance. Problem solved! They visited a neighborhood house that had been altered to make it wheelchair accessible and they interviewed the owner of the building. 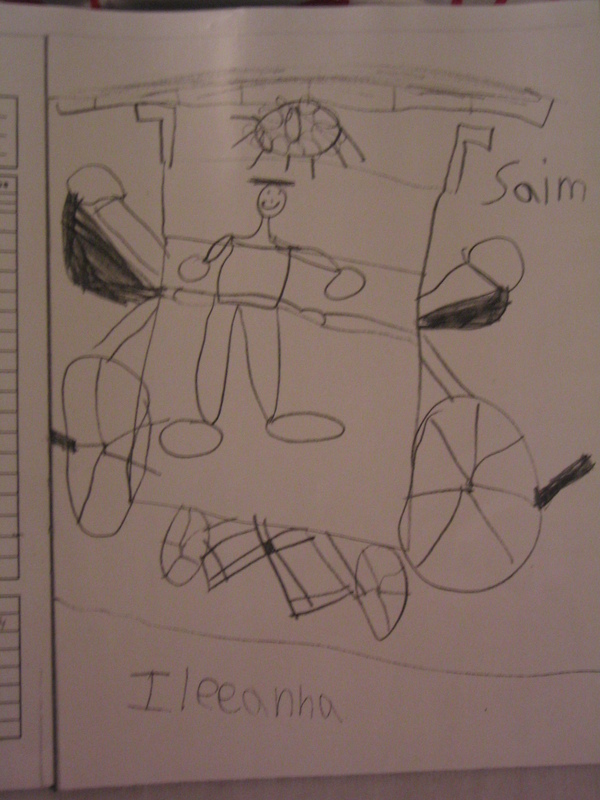 This study certainly held the interest of the class and raised a new awareness of the challenges in Saim’s daily life. The children developed a feeling of respect for Saim and for the other children in the school who used wheelchairs, walkers and crutches. Over the years, I have returned to the school to visit Dana Roth and I’ve always been intrigued by the variety of studies taking place in her classroom. On one visit, the children were investigating colors – inventing colors, exploring the various names of Crayola crayons and coming up with their own inventive names for their newly mixed colors. 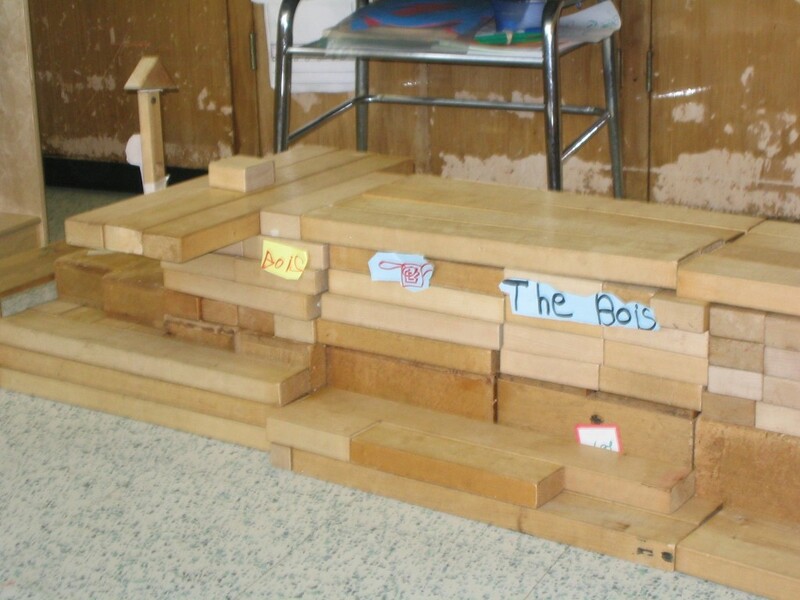 On another visit, the children were building a school in their dramatic play center, reflecting their investigation of their own school. Dana still does some thematic studies but she also listens closely to her children and develops inquiry projects based on their interests and wonderings. I haven’t worked at the school for the past five years, but I’m going back in the fall to, as Laura Scott, the new principal, says, “Give a refresher course” in inquiry studies to keep it alive and well at the school. Let’s see what happens. 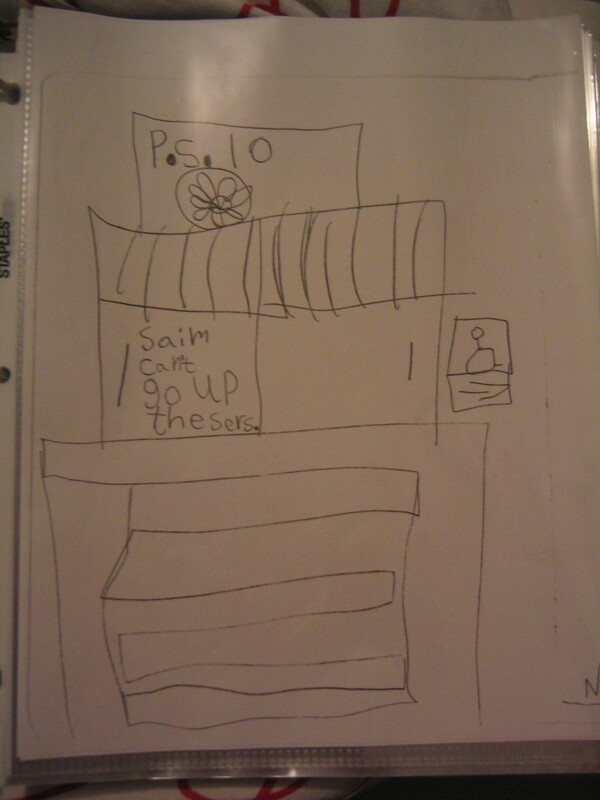 This entry was posted in Investigating Choice Time: Inquiry, Exploration, and Play and tagged accessibility, anticipatory web, block center, Brooklyn, Choice Time, consultant, Dana Roth, inclusion, inclusion team, inquiry, inquiry project, investigation, Jett Ritorto, Laura Scott, lift bus, movement, narrow the focus, observation center, over-programmed, P.S. 10, physical therapist, Renee Dinnerstein, schoolbus, staff developer, staff room, thematic study, theme, transportation, transportation unit of study, web, webbing, wheelchair, wheelchair friendly, wheelchair study on June 19, 2012 by Renee. Constance, I’m really looking forward to meeting you too. I think that the trip will be so wonderful. I can’t get over how many interesting people are coming! I’m also eager to check out your blog! this is so much the approach I am luckiy enough to be able to use in preschools is Sweden – there children are aged between 1 and 6 – so children do have a long time to learn through play. The first year at school is called preschool class and is when the child is 6-7 yrs old and then will start to formally learn to read and write at age 7 in first grade.